Hand protection and arm protection are obviously important to those working day in and day out with their hands, and we’ve got cut-resistant gloves and puncture-resistant gloves all the way up to and including ANSI cut level 5. 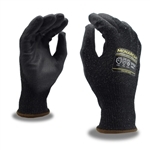 Our Kevlar cut-resistant gloves are very popular. After all, this is the stuff they make bulletproof vests out of. Our selection of industrial gloves include incredibly useful OGRE mechanics gloves made from Ultra High Molecular Weight Polyethylene (UHMWP), with TPR (Thermo-Plastic Rubber) reinforced fingers and backs. 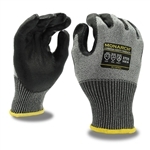 Palms on these CR gloves consist of a slip-resistant, gray polyurethane coating. No more mechanics’ busted knuckles here. This is just one example of nearly five dozen CR glove and sleeve choices you’ll find here.